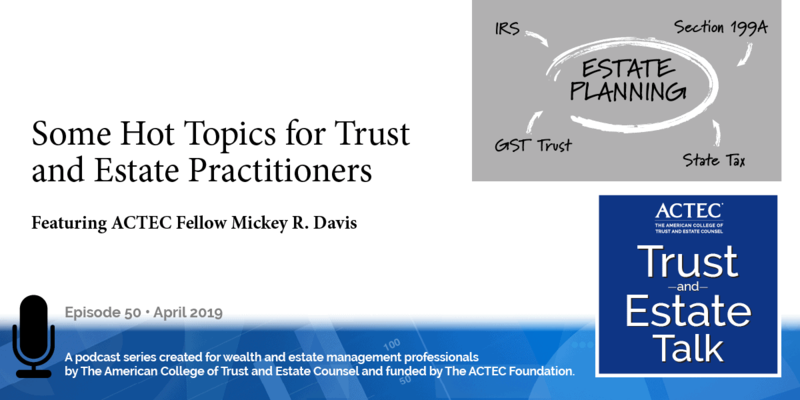 “Ethical Considerations in Representing Clients in Connection With Family Businesses.” That’s the subject of today’s ACTEC Trust and Estate Talk. This is Susan Snyder, ACTEC Fellow from Chicago. 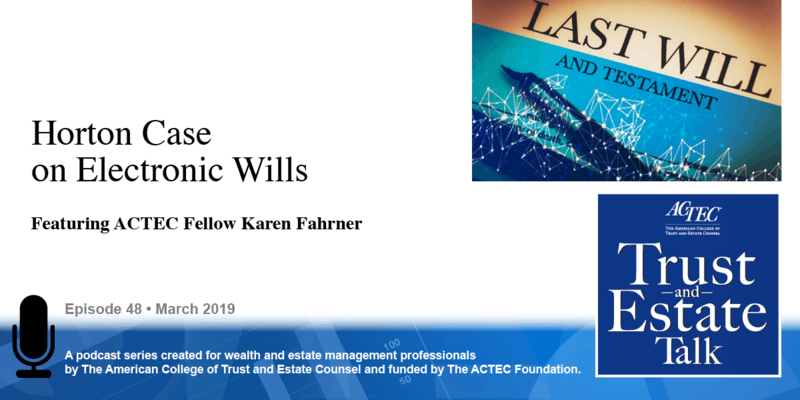 Who is the client in the context of representing clients in connection with the family business? 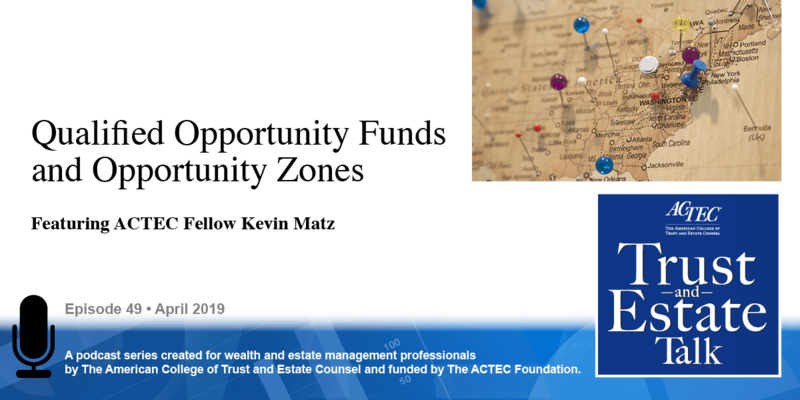 To learn more about this topic, you will be hearing today from ACTEC Fellows John Rogers of Los Angeles and Lee Osborne of Roanoke, Virginia. Welcome, John and Lee. Thank you. This is John, I’ll start off by just making a little bit of an introduction here. The issues that we’re dealing with have to do with the fact that invariably, when we are planning and dealing with the administration or governance of family-related businesses, we’re dealing with two or more individuals who are involved in some capacity or another. And that means that we are dealing with either the potential or the actual existence of conflicts of interest and how to try to avoid them, first of all and, if we can’t entirely avoid them, how to deal with them. So, what we’re going to talk about for a few minutes is that aspect of it and perhaps a little bit about how we manage this on the writing side of things. And so, Lee, let me ask you if you wouldn’t mind commenting about the issue in general and how you approach the representation at the beginning of the process. Thank you, John. This is Lee. I think most of the time we think we know who our client is, because a lot of times these things start out where you’re representing an individual or a couple, and they may come in to you and want you to set up a business for transfer tax purposes for thinking in terms of passing the business on to a younger generation or involving them in the business activity. It may be an operating business where the children have started to step into the business. But, what we find is that as the relationships and the complexity of what you’re doing evolves that you need to make sure that you’ve identified at every step from the beginning and as things do change: who the client is, who you’re representing, what services you’re going to provide to them, whether there are any conflicts of interest, either actual or potential. I think we all know certain conflicts are waivable, and if you do that you need to go through the proper steps to get informed consent and document the waiver. Then we also, as you go through the course of working in some of these situations, things will change. You will find that there maybe is a change in who is managing or operating the business, and in that situation, we tend to then have to determine are we also representing the business? And if we represent the business does that mean we’re representing, what they call the constituents for the business – those who are authorized to manage the business or representing individual owners? So, that’s how, as the relationships evolve, your representation has to evolve and your documentation of that also has to evolve. 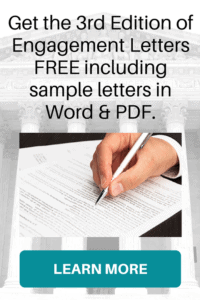 So one of the really terrific tools that is available to everyone are the model Engagement Letters that have been propounded by ACTEC, and those engagement letters substantially deal with the issues that may arise in terms of laying out – spelling out – I should say, to the prospective or actual clients, the problems that might arise in the representation and asking for their informed written consent and possibly waiver of certain kinds of conflicts in advance. Are those generally effective, do you think, Lee? I think they are; they’re like any form; they are a tool you often have to adapt to whatever the circumstance is. We have three letters in the business context. One assumes that you are primarily representing the entity and not any of the owners, one assumes that you are representing the entity and the owners, and the other assumes that you are representing the owners and not the entity. And so you would pick the basic format. 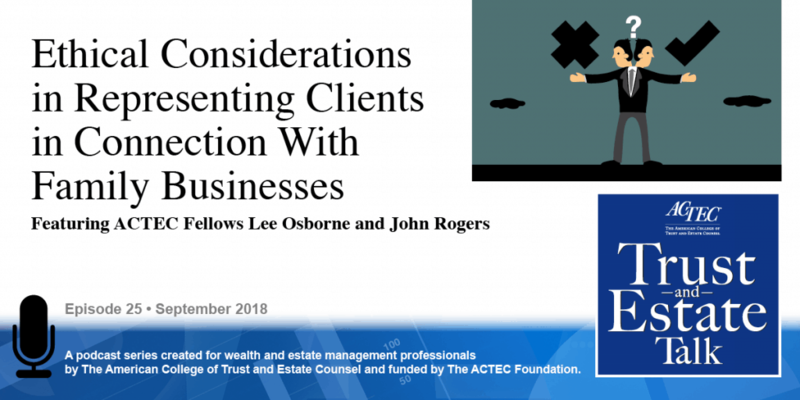 There are consistent elements of those letters which address things like identifying who the client is, identifying how potential conflicts of interest might arise, acknowledging that at this point there are none and there’s a consent to the representation. Informing people/the parties that are involved in this that, whether or not they or how confidential information will be handled or shared, so you have to deal with confidentiality; that’s certainly a related issue. Also communication, access to documents. What happens in the event that the representation terminates? And sometimes you have a situation where you have been involved in representing one of the organizers of the entity ahead of time, and in those situations, the letters give you a way to try to accommodate upon termination continuing to represent that original owner or client. So, they’re very useful tools; they don’t work in every situation, but they provide you with material that you can then draw upon and make your own documents from. And I dare say, if there’s a situation which those forms of letters don’t work, then it probably is an indication that the hoped-for representation in whatever the context or configuration was is not going to go forward and it may have to be rethought, and then, in other situations – you alluded to it – and in situations you can where it may become necessary to withdraw from representing one or more of the clients if one has taken on representation of more than one initially, perhaps to end up having to withdraw from representation of all of the clients in some circumstances; that may be unavoidable, and I should add, that again, in the ACTEC Engagement Letters there is also a chapter on termination and withdrawal, and there are some sample forms for that purpose too. Now, we should bear in mind that every situation is, of course, different, and we are obligated as attorneys to be mindful of that. The fact that any sample is only that, we need to be mindful of our jurisdictions, laws, its rules of professional conduct and the like, and operate under the basis of that as we go along and making sometimes some very difficult decisions about our relationships with those clients. And I think probably the most important thing is once you’ve addressed the fundamental conflict issues and determined that you can go forward with the representation, that you have a deliberate communication with the different parties that they be involved in this organization or in the family. And you take a very intentional approach in terms of addressing what the potential changes might be down the road, how they will be handled, and what effect they would have on your representation. And a couple of closing thoughts on that and one of those is – and you actually used the word and I will repeat it a couple of times – communicate, communicate – that is absolutely essential; always be prepared to do that. And yet, at the same time, part of that is also to communicate to those that are not clients and inevitably that comes up as a potential issue; absolutely imperative to make sure that we inform those who are not our clients, that, if necessary, they need to engage their own counsel. Make sure there is no confusion about that. So I think that should take care of it for us right now. Nice talking with you, Lee. Thank you. I’ve enjoyed it John. Thanks to you both for helping us address ethical challenges in dealing with a family business.